This tasty quote came from a New York Times article about business founders becoming brand icons. The email summarized research a public relations firm did for Macy’s. Well, I've already written about how insidious Martha Stewart can be and by the way she made a cameo in my book Powder Dreams. But that was three years ago and recently a funny thing happened. One Saturday I flipped on the TV - unusual in itself - and there was Martha Stewart's Cooking School. She was doing pasta sauces. At first I was curious. Martha started with a Bolognese. By the time she was rasping bottarga, I was hooked. Not only was I hooked, but I totally agreed with her. She has great taste. She seems to have moved beyond her jailbird years and is making some effort to soften her image. Some efforts do not work, like the anecdotal stories she uses to make herself more appealing. What did work was seeing her hands, which reflect a human mortality that even Madonna cannot escape. She also genuinely loves the food she cooks, taking each creation in with her perfectionist eye. She then stoops over for a smell and by the time she's sampling her own cooking, you can almost taste how good it is. The side shots also show an ageing and thickening figure which gives just a hint of grandmotherliness. 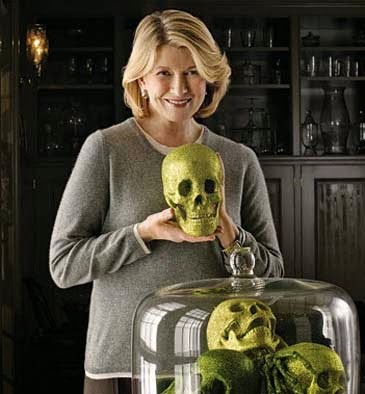 This is the same Martha Stewart who made an appearance as an alien in one of the Men In Black movies. Barry Sonnenfield, the director, once saw Julia Child and Martha Stewart making the same cake or something. (Fresh Air has many of their old shows still in Real Media, making the Barry Sonnenfield moment too damn technologically difficult to listen to). I remember very clearly that Martha's creation was perfect whereas Julia's was a disaster. I'm reading Julia Child's My Life in France, and I'm looking for Martha's ambition in Julia but instead what I see is someone who dives head first into the river of life. Martha Stewart still deserves praise for so many things (e.g. making less expensive 100% cotton sheets available to the masses) and apparently there's a whole new generation which follows her but does not necessarily love her. Julia Child, on the other hand, will be adored for a very long time.